Are you a bean person? 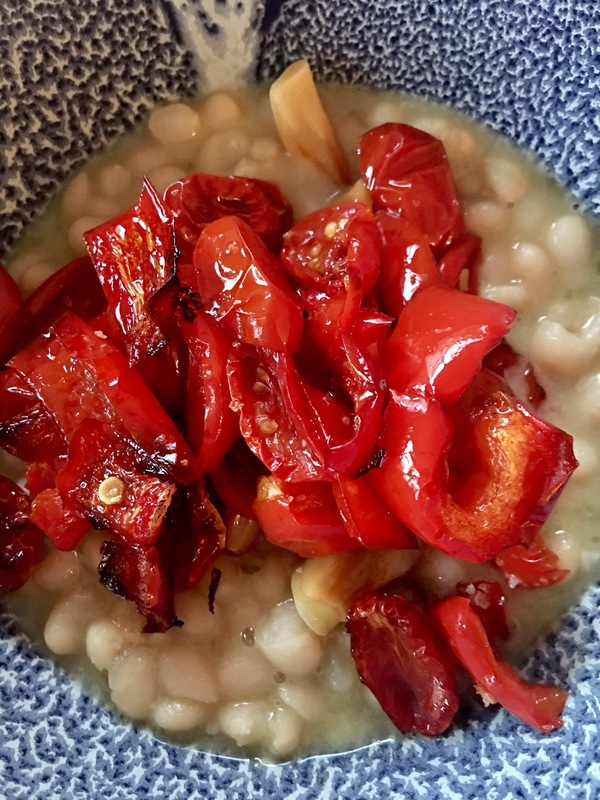 I mean do you adore beans as a stand-alone dish? Revel in their unique flavors and textures? I'll admit. I haven't been. 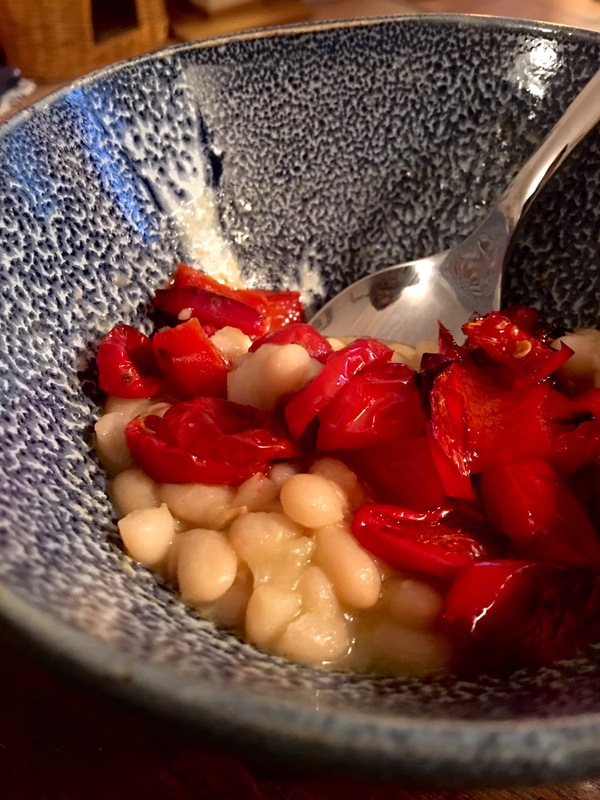 I like them well enough--I enjoy garbanzos in a salad or cooked and pureed into hummus. I'm all in for beans in chili or stews or soups. Barbecue baked beans are more a delivery system for sauce. Basically, I just haven't really pushed myself to seek out beans that stand up to taking a starring role in a dish. Until recently. I'm a longtime fan of Rancho Gordo, which is bean heaven for aficionados, especially heirloom bean aficionados. 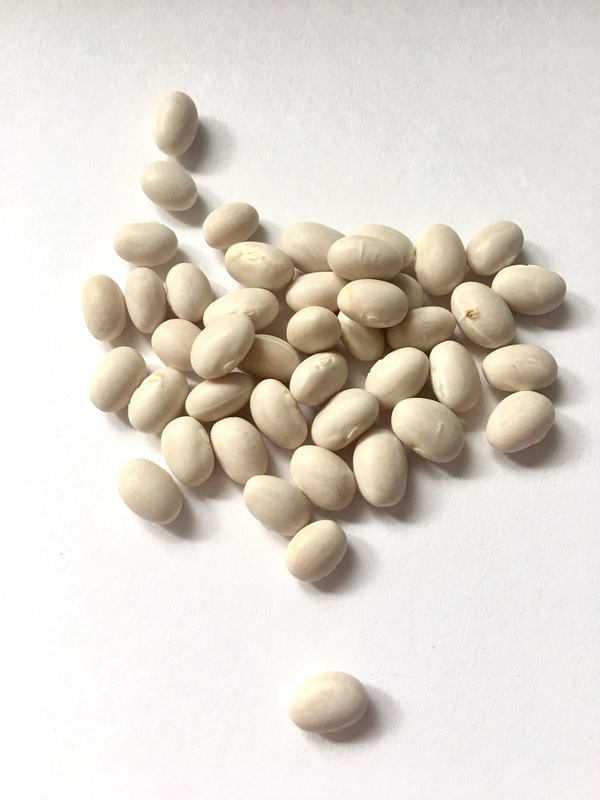 I was noodling around on the site and came across Alubia Blanca beans. These small white heirloom beans are a customer favorite so I figured I'd order some and see what all the fuss was about. I was gobsmacked. They've totally changed how I feel about bean potential. Now, Rancho Gordo has lots of helpful, inspiring recipes on the site. The Spanish-style Alubia Blanca beans can be used in soups, salads, baked beans, bean dips, and pot beans. According to the website, they're marvelous cooked and spread on grilled Tuscan bread, topped with a green, fruity olive oil, chopped fresh sage, and grated hard cheese. I did something different. 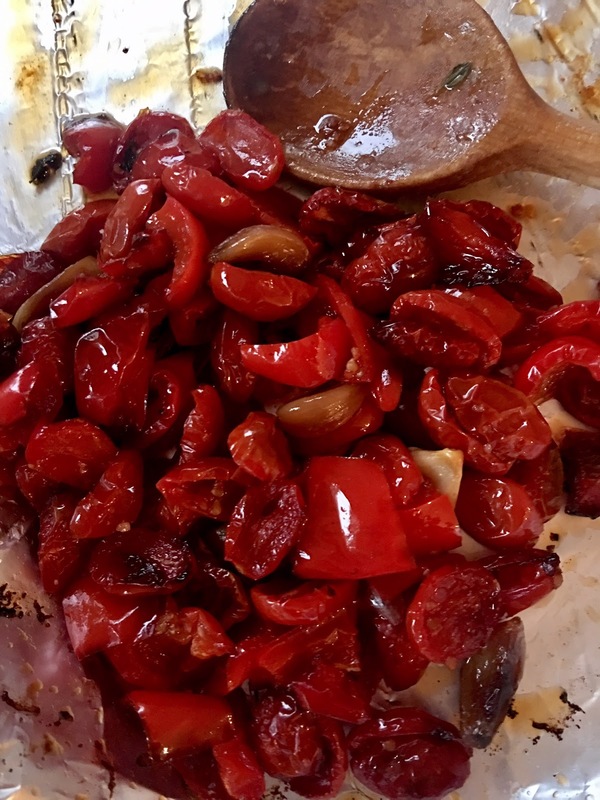 I just cooked them, using a very basic technique that I'll share--and then I topped them with roasted tomatoes, peppers, and garlic. It was so simple, yet so profoundly perfect a meal it made me want to weep with joy. Beans! Who knew! First, I poured out about a cup of beans and checked them for debris. Then I put the beans in a medium-size bowl and covered them in water, letting them soak for about six hours. This speeds up the cooking process and lets the seasonings you cook them in permeate them more easily. The cooking process itself was simple. In a saucepan, I sautéed half a diced onion with minced garlic in olive oil until I could smell their fragrance. I drained the beans and added them, along with some sprigs of fresh thyme. Then I added water to cover by about an inch. I brought the mixture to a hard boil, then reduced the heat to a slow simmer and let them cook. I thought it would take a couple of hours for the beans to cook through. I'm so glad I checked after an hour because even then they already were nice and al dente. I added some sea salt, stirred, and removed them from the heat. And that was it. I gave them a taste and was amazed at how they had transformed into a mouthful of delicate, creamy sweetness. While they were cooking, I addressed the topping. I had a large bowl of cherry tomatoes I couldn't keep up with and they were starting to go south. So I sliced them in half. To them I added a red bell pepper my mom had given me, cut that into bite-sized chunks. And I had a head of garlic from which I took about half of the cloves. I peeled those and tossed them with the tomatoes, pepper chunks, olive oil, and sea salt. I poured them onto a piece of foil and slow roasted them at 300 degrees for about an hour, when they had collapsed and made their own sauce. I poured about half the bean mixture with its lovely pot liquor into a new blue and white speckled bowl I had recently purchased at the Empty Bowls fundraiser held annually at Coronado High School. Then I topped the beans with the roasted tomatoes. I could have added grated cheese, but I ate this bowl of beans as is and marveled at how the flavors of the beans and vegetables melded. At how simple and satisfying each mouthful was. I couldn't wait for the following day, when I could eat this dish all over again as leftovers. So, yeah, I'm now a bean person. Funny the food you come up with because you need to use up some random ingredient. For me, it always seems to happen when I have buttermilk in my fridge. It would be so wonderful if the companies that package it would come up with a little carton--like the size of the ones that held milk at my elementary school cafeteria. But they don't and I hate to waste so then I'm off and running (often back to the market) to make something else with the remaining buttermilk. As a result of recent cornbread with buttermilk, I had most of a pint left. I brined chicken with some but still have a good amount remaining. I started randomly googling buttermilk and saw cakes. Oh. How about pound cake? Oh, but all that butter (which I love, but still). Well then, how about substituting olive oil for the butter? (And does that mean it's no longer a pound cake?) I have a bumper crop of Meyer lemons so I could add lemon zest to the batter and, ah, that gorgeous bottle of homemade vanilla that Robin Ross of Cupcakes Squared gave me. That would taste wonderful. As you can see I was off and running. I did a little research to get a sense of how much oil I needed to substitute for the butter and it was just a matter of mixing it all together--then sprinkling some sugar on the top of the batter to get a nice crispy crunchy top. 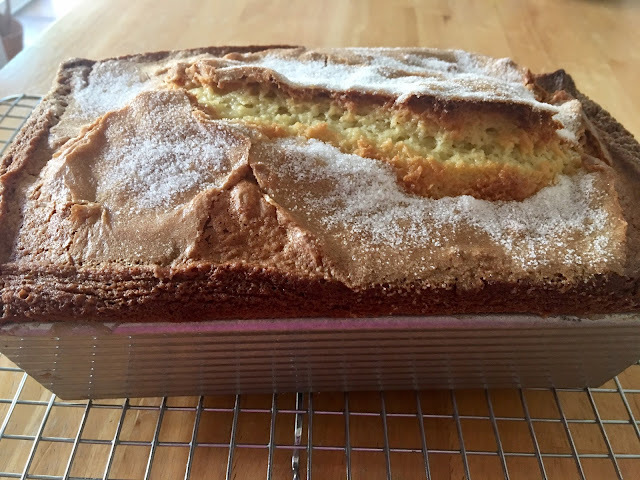 All this is to say that if you're a home cook who feels comfortable riffing on chicken dishes or pasta dishes but believes you have to go strictly by the book with cakes, well, I'm like you--but I can now say I feel more comfortable taking some liberties with baking recipes. The cake rose tall in the large loaf pan and was wonderfully moist. It had a nice lemony aroma and flavor. The buttermilk complemented the citrus with its tangy flavor and richness. For those who haven't had a great experience baking with olive oil, I guess it depends on what kind of olive oil you use. A young, very grassy oil may give you a little too much bitterness. But a more mature oil is actually more buttery in flavor and plays well in a cake--and, especially this cake. You'll get a lot of slices out of this and it is rich. The good news is that it also freezes well. 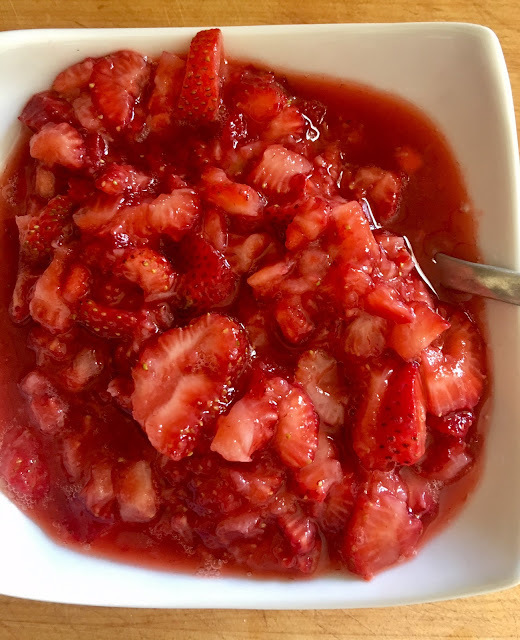 And take advantage of the season by mashing ripe berries, adding a little Cointreau and sugar (if necessary) to top the cake slice when you serve it. Combine flour, lemon zest, baking powder, baking soda, and salt in a bowl and whisk together. Place sugar, olive oil, and vanilla in bowl of stand mixer and beat at medium speed until thoroughly blended. Add eggs one at a time, beating well after adding each one. Alternate adding flour mixture and buttermilk, starting and ending with the flour mixture. Spoon batter into a large (9 ½” by 5 ½”) loaf pan, coated with baking spray. Sprinkle top with sugar. Bake at 350 degrees for 1 hour or until toothpick inserted in middle comes out clean. Cool pan on wire rack for about 10 minutes. Then run a thin knife around the edges of the pan and remove the cake. Continue cooling on the wire rack until it reaches room temperature. It's so easy for contemporary home cooks who consider themselves sophisticated in the kitchen to poo poo casseroles. Many of us grew up in the days of tuna embalmed in noodles and Campbell's mushroom soup. Or macaroni and ground beef. Yeah, we've all been there. But think of it this way: lasagna is essentially a casserole and we all love lasagna. 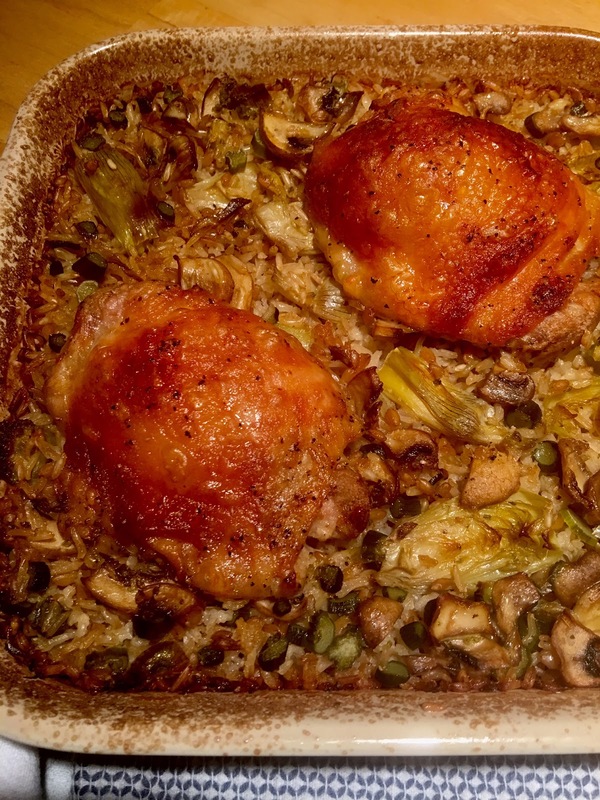 It's really a matter of what you do with the concept, which is basically a meal in a baking dish. For some, it's a way to use up leftover ingredients. For others, it's the quintessential dish you bring with love to friends or family who are too stressed (from grief, illness, new babies) to be able to make meals themselves. I got to thinking about this recently when I saw a piece on casseroles in The Kitchn. They ran a list of casserole links and what was interesting was that recipes not only described how to prepare the dish but in advance of that, how to prep the ingredients for freezing and provide instructions to the recipient for then making it. One of those recipes struck a chord with me. It was baked chicken with rice. Once I sorted through the freezing instructions, which I didn't need, I realized that this was a casserole I could fall in love with. 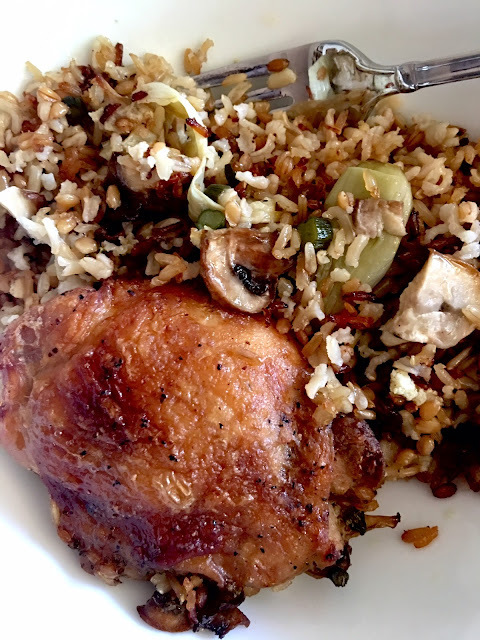 After all, it takes two dishes I really enjoy--roasted or baked chicken and grains filled with vegetables and herbs and spices. All this does it put them together in an easy-to-make, one-dish dish. Like all great casseroles, you can change this up, depending on the season or the ingredients you have or prefer. 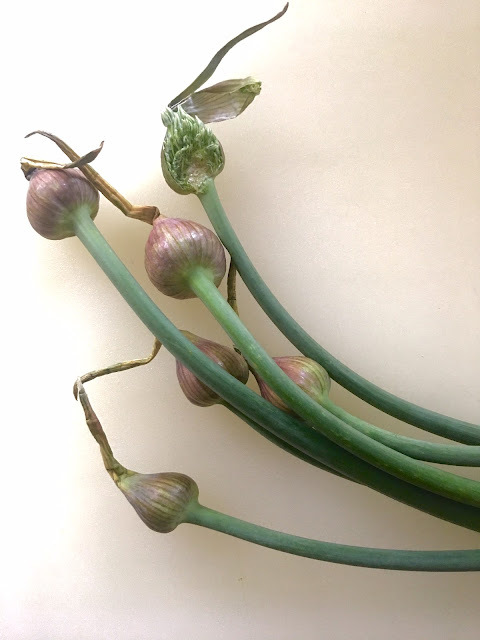 I happened to be at Specialty Produce recently and they had elephant garlic scapes. These are a rare find so I nabbed what I thought I could use (I usually make pesto with scapes) and decided to add some to my casserole, along with mushrooms, marinated artichoke hearts, and onion. You could add sliced kalamata olives and capers for one specific flavor profile. Or you could go in a totally different direction with tomatillos, fresh poblano or Anaheim chiles. Or eggplant, zucchini, red bell peppers, pine nuts, and za'atar. Cooking for one? I am--I easily cut this recipe in half for two meals. I just used a smaller baking dish. So, use this as a foundation for building your own one-dish wonder. I hope you'll share with me what you came up with. 1. The day before you make the dish, combine the chicken thighs and vinaigrette in a freezer bag. Seal and massage the bag to coat the chicken. Refrigerate overnight. 2. Preheat the oven to 375˚F. 3. Grease a 9X13-inch baking dish with olive oil. 4. Combine the vegetables, grains, and herbs and spices in the baking dish. Stir in the liquids. Remove the chicken pieces from the bag and place them on top of the grains mixture. 5. Cover the baking dish with foil and bake for 1 hour. Uncover the dish and bake for up to another hour. You want the grains to have absorbed the liquid and the chicken to be cooked through with crispy skin. One thing you learn about pastry chefs: they are all about precision. Case in point. 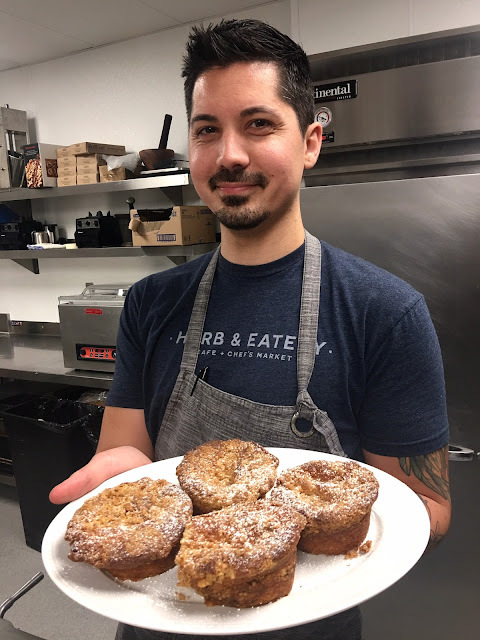 I was with pastry chef Adrian Mendoza of Herb & Eatery last week so he could teach me how to make his Gluten-Free Almond and Walnut Coffee Cake. We got to talking about the kitchen and he told me a story about a new pastry assistant who came to work. When it came time to label a batch of pastries, she automatically ripped off a piece of masking tape to write on with her sharpie. Nope. Mendoza told her she needed to use a scissors to cut the tape. Apparently, she laughed, thinking he was joking. He wasn't. "I know it seems like a small thing," he acknowledged. "But I'm meticulous about what I do and those details create discipline in the kitchen, which you need in baking. So, yeah, I had her go back and cut the label with scissors." Mendoza grew up in Apple Valley, California. He didn't grow up cooking, although he enjoyed watching his mom. But once he got into high school he attended after school cooking classes from 3 to 7 p.m. three to four times a week. "I loved it," he said. "But I didn't think about becoming a chef. Actually I was thinking of becoming a mechanical drafter. I loved the precision. I remember learning how to build bridges from toothpicks." 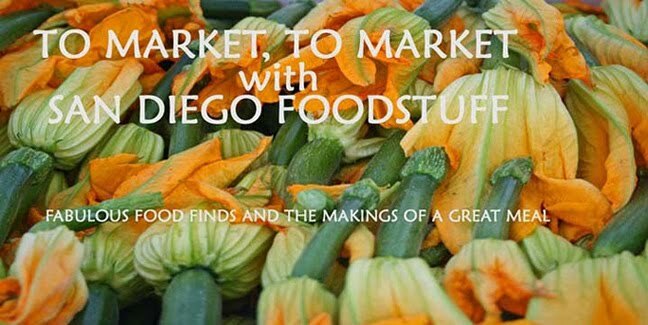 But when Mendoza graduated from high school, he decided to leave home for San Diego to attend the Art Institute's cooking program. It was a choice, he said, of working behind a desk all day or being able to move around and produce something creative that people would enjoy. He also got a job at MacDonald's--on Aero Drive. There, he said, he learned about organization skills and timing. And, he got a job working on the savory side at Oceanaire, which is where he met Chef Brian Malarkey, whom he works for now and at Malarkey's previous restaurants. Mendoza also took some time to go to L.A. to work, including a one-year stint at Spago plating desserts. 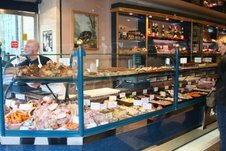 A bakery then hired him, and sent him to France for two weeks to train on equipment. "That's where I got really in depth with croissants and baguettes," he said. 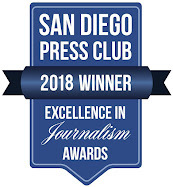 In fact, Joanne Sherif of Cardamom Cafe and Bakery, whom he worked for part time while he was working at Oceanaire, told me recently that she thinks he makes the best croissants in San Diego--and they are magnificent. 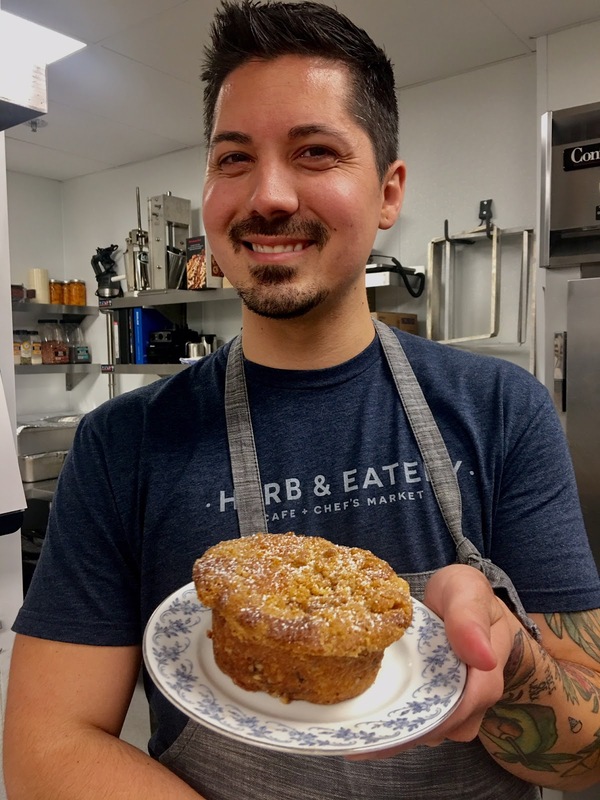 Today, Mendoza works with six assistants--a bread baker and five pastry assistants--along with an intern to produce a wealth of breads, croissants, bagels, bialies, and sweets for both Herb & Eatery and Herb & Wood. The morning I was there, his assistants were working on a huge batch of Sea Salted Chocolate Chip Cookies. Earlier in the morning there were loaves upon loaves of challahs--both plain and topped with spices. They were almost gone by the time I was ready to leave a couple of hours later. I was able to snare one small plain one and a bagel--a really great bagel, in fact. But what I was there for was the coffee cake. Now I'm not gluten free so I didn't care about that aspect of it, but I love a good coffee cake. The fact that it is gluten free makes it that much more interesting in terms of baking science. Mendoza uses Cup4Cup gluten-free flour, which is easily found at Whole Foods, Sprouts, Amazon, and Sur la Table. 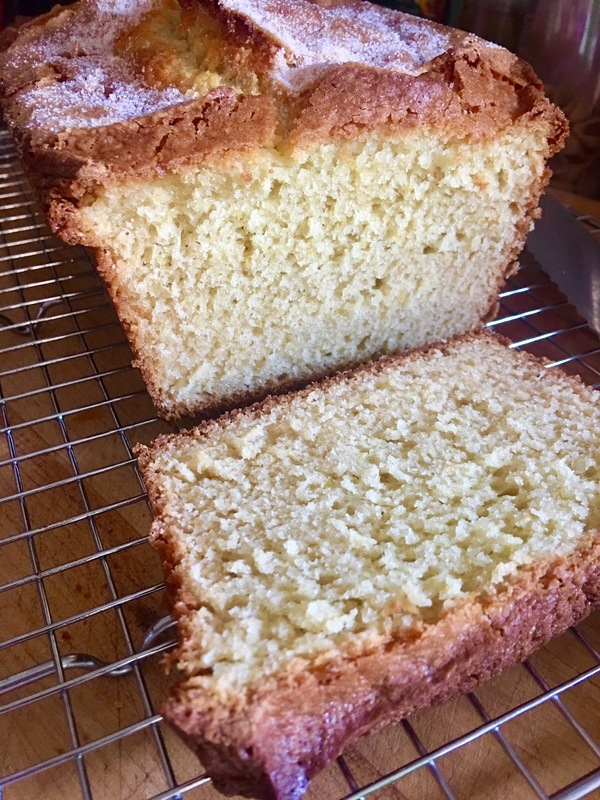 That means if you aren't interested in baking this cake gluten free you can simply use all-purpose flour in the same measurements. He also adds almond flour or almond meal, which, he says, acts as a tenderizer. You can buy it or grind it yourself from almonds. The cake is pretty easy to make, but it has three distinct components. 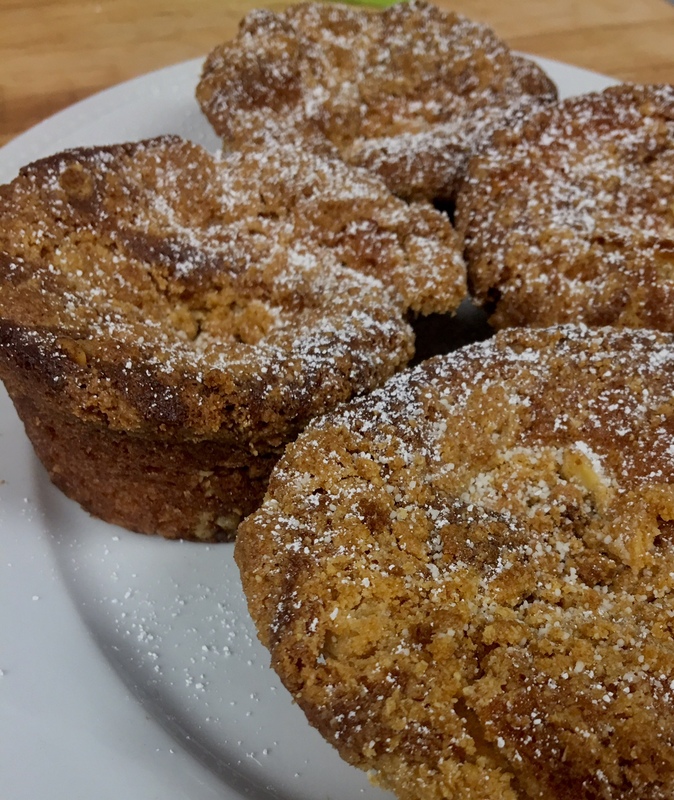 There's the cake batter, the streusel center--with walnuts, brown sugar, and cinnamon--and a crumble top--with butter flour, sugar, and sea salt. We started with the crumble. Mendoza used a food processor (but you could use a stand mixer with the paddle attachment). 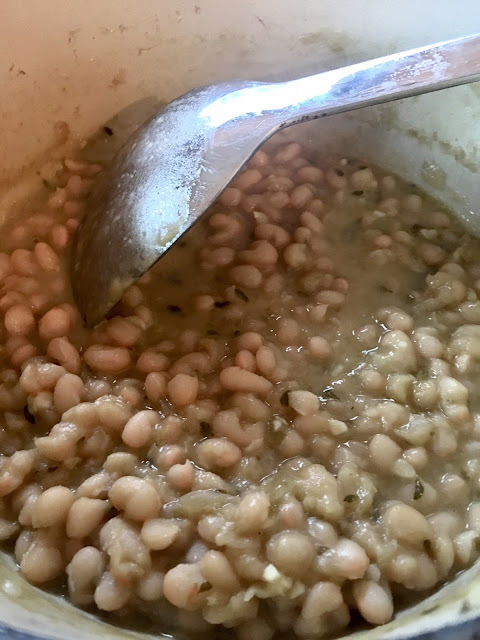 It's a simple process of combining the dry ingredients in the bowl and pulse until combined, then adding the butter and pulsing until the mixture forms pea-sized pieces. Put the mixture into a bowl and refrigerate until you're ready to use it. Then we moved on to the streusel center. You'll want to toast the walnuts to bring out the flavor. Don't care for walnuts? Not a problem. Use pecans or pine nuts or cashews. Or a mix. Again, you'll combine the ingredients in the bowl of the food processor and pulse about 20 times until the walnuts are about 1/4" pieces. Put that aside. Okay, so then it was time for the cake batter. We switched to a Kitchen Aid mixer. Our butter was at room temperature and, as you can imagine, all the ingredients were already measured and waiting. First you'll cream the butter, sugar, and vanilla, starting on low for about 20 seconds and then amping it up to medium high for four minutes. What you're doing, Mendoza explained, is building air to help absorb the eggs. Your key to completion is light and fluffy butter and sugar. And, by the way, you'll notice that Mendoza uses crème fraiche in the batter. He doesn't buy it, of course. He makes it. It's just two ingredients--cream and buttermilk. If you want to make it yourself, use a 4 to 1 ratio of cream to buttermilk and leave it on the counter, covered, for two days at room temperature. You'll have a terrific, tangy sour cream. 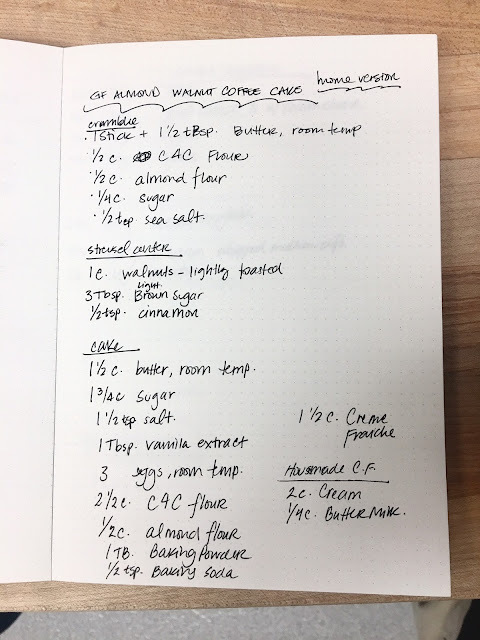 Back to the batter: While the butter, sugar, and vanilla are creaming, sift together all the dry ingredients but the almond flour (over parchment paper so you can pick it up and use it as a funnel to add to the wet ingredients. Once, the dry ingredients are sifted, you can add the almond flour on top. Put that aside and--once the butter mixture is fluffy--add the eggs, one at a time, stopping and scraping down the mixture with each egg. Then you'll add a third of the dry ingredients, mix on low briefly, then add half of the crème fraiche, then the dry ingredients, the rest of the crème fraiche, and then the rest of the dry ingredients--scraping down with each addition. Don't over mix the batter or it will turn gummy. We're almost there; it's all assembly now. You can make the cakes in muffin pans, as we did, or cast iron pans (which will take a little longer to bake). Whatever you choose, butter the pans (Mendoza uses a spray product called Vegalene, which is gluten free). You can also use cupcake liners. To add the batter you can use a spoon or ice cream scoop--or a pastry bag, which Mendoza used. He uses KopyKake disposable bags (Amazon sells them). Place a 1/8" layer of the batter at the bottom. Then a small handful--about a tablespoon or two--of the streusel over that. The another thin layer of batter followed by a couple of tablespoons of the crumble topping. Bake in a 350° oven for about 30 to 35 minutes or until golden dark brown. I have to say that gluten free or not, this is a terrific coffee cake. The cake itself is moist and you'd never know that alternative flours were used. You get a fun surprise in the middle with a bite of the streusel--and I'm all about a good crumble. The cake just works. I brought some to my mom and she loved it. It's a hugely popular menu item at Herb & Eatery, but Mendoza told me the staff does give customers a heads up that while they do their best to segregate their gluten-free baked goods from their conventional wheat pastries, there is always a risk of cross contamination of flours in the air. If that's an issue, be forewarned. If not, enjoy! 1. Combine all dry ingredients in the bowl of the food processor fitted with the blade attachment or in the bowl of the kitchen aid fitted with the beater attachment. 3. Add the butter and pulse or mix on low until they are pea-size pieces. 4. Place into a mixing bowl, cover, and keep under refrigeration. 1. In the same bowl of the processor, combine all ingredients and pulse about 20 times until the walnuts are ¼" pieces. 1. In the bowl of the stand mixer fitted with the paddle attachment, cream the butter, sugar, salt, and vanilla extract on low speed for 20 seconds. 2. Increase the speed to medium high and allow to blend for 4 minutes. 3. Meanwhile, combine the dry ingredients except the almond flour, and sift. Add the almond flour on top. 4. Scrape down the butter mixture and add the eggs in 1 by 1 scraping down after each addition. 5. Add 1/3 of the dry ingredients, mix on low for 10 seconds, add ½ of the crème fraiche and, scraping down after each addition. Repeat until you finish adding the in dry ingredients. 1. Spray pans well or can line with cup cake paper. 2. Place batter into pastry bag and snip a ½ “ tip or can use a spoon. 3. Place a 1/8th inch layer of batter first. 4. Place 1-2 tbsp of walnut streusel. 5. Place another 1/8th to ¼” layer of batter on top. 6. Followed by 1-2 tbsp of crumble topping. 7. Bake in a 350F oven for approximately 30-35 minutes until golden dark brown. 8. Allow to cool for 15 minutes in the pan before taking out, they are fragile. 9. Dust with powdered sugar or however you would like to decorate. A scoop of ice cream on top with fresh berries is a nice dessert.